Gene Autry Centennial Scully Shirt Mens' "Bluebird Tan"
This Scully shirt is inspired by Gene Autry's Bluebird boots, which are now in the Autry National Center's permanent collection. If you live by Gene Autry's Cowboy Code, you can now look the part in a shirt made especially to celebrate the Gene Autry Centennial. 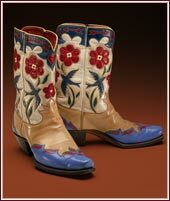 The Scully Western collection represents apparel from all periods in American history up to, and including, current Western and Southwest fashions. Scully strives to creatively incorporate design details from every era. The result is award-winning apparel which is known and appreciated for its quality and innovation. Also available in Ladies' sizes.